A worthwhile goal in life, beyond the norm of family and career, is the often rewarding search for the ultimate experience of luxury. Most people may not have the time or the resources to think much about all of the aspects that would go into such a quest, but for the few who do, and who have scoured the earth in search of this beautiful and comfortable place, their journey inevitable leads them to the charming resort town of Hua Hin where they begin a careful search for the happiest of man made creations, a pool villa in Hua Hin. What a delicious discovery it is to come across V Villas Hua Hin in your search then for a pool villa in Hua Hin. This resort is so gorgeously designed that it is like entering another world, in fact, a world of surreal beauty and tranquility. Every villa, along the gentle hedgerow path down to where the infinity pool seamlessly kisses the horizon, is cloistered in total privacy, created to give you the comforts of your own space entirely. Each villa offers its own private pool just inside the secluded courtyard of your villa. 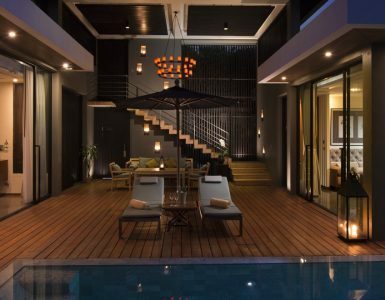 Imagine yourself here now, waking up at the hour you desire and having a morning swim in your own pool villa in Hua Hin. After this, you might call your 24-hour butler and order up a delicious breakfast of your choosing. 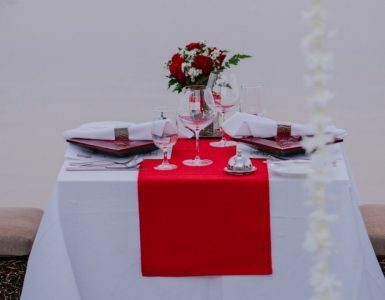 Or you might visit the fascinating Villazzo restaurant and enjoy its highly awarded cuisine there in one of its surprising and beautiful sunken tables. After a day of relaxing in the resort or sightseeing around Hua Hin, it will be so pleasureable to return in the evening and have your favourite drink beside your pool in your pool villa in Hua Hin with your beloved one next to you.